Having launched Wine Travel Guides in May 2007 with a wealth of information on planning your own private wine tour, in December 2008 we thought it was high time to add a blog. 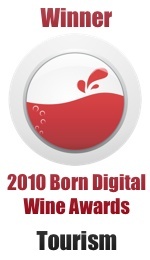 In May 2011, Wink Lorch was the proud winner of the Best Wine Tourism Feature in the inaugural Born Digital Wine Awards 2010 with her post on this blog about the French Alps. Runner up was Tom Fiorina also with a post on this blog about his specialist region Corsica. In May 2012, Louise Hurren, who is a guest writer on this blog, was runner-up in the same category for her blog post about Bucelas in Portugal. On the blog you will find news and views from the world of wine and travel from a few of our contributors and also from some good friends and colleagues. We have deliberately decided not to include tasting notes as there are so many other blogs out there who do. Instead, we bring you tales of our own visits to vineyards and wineries, plus of course, recent discoveries of places to stay, eat and shop. Some of these will be from countries and regions not yet covered by our main website. Occasionally, we will use the blog to update you on the guides available on the main website. You will also see some older posts relating to the Twitter Quiz – an occasional quiz we used to run where the prize as a PDF wine travel guide of your choice by answering a cryptic wine travel question on Twitter. The answer was also published here (together with the winner’s Twitter address) usually with some gentle education about the wine place in question. We would love feedback about our stories of wineries and other places we visit. Please feel free to make a comment – we will approve comments as quickly as possible. Thank you for visiting us. You can follow the blog with this feed. Wine Travel Guides and its blog are fully owned by Wink Lorch who you can contact here.